We've had a tremendous response to our song contest which we kicked off this past month and we thank everyone for their wonderful efforts. This is a quick reminder that there are ONLY THREE DAYS LEFT to submit an entry for this month's contest if you want a shot at winning the first song. Don't know what we're talking about? All the details are in the "Especially for You" section at Poppermost.com, but the crux of it is that for the next 12 months, we're having a contest. One lucky winner per month will win a song written especially for them. The theme will be different each month and at the end of the contest, all the songs will make up our next album. For all our loyal readers, here's some new information so you can get a jump start on the next entry. Where does the wishing well reside? Remember to check Poppermost.com in about 2 weeks when the first winner will be announced and their essay posted. The winner's song will be ready in a couple months; we'll keep you updated. In the meantime, we hope everybody is starting to get into the holiday spirit. Christmas, Hanakuh, and Kwanza are practically around the corner and this is the time of year for extra kindness, love, and joy for our friends, family, and even strangers. A smile is a wonderful gift to give! "Popperchat Number Two" on MySpace! We here at Poppermost HQ would like to send everyone our wishes for a very Happy and safe Thanksgiving season. No need to wait for the 22nd to be thankful; start early! Make it a memorable holiday for everyone you love. Also, please listen to the second installment of the high-flyin' antics of your favorite birdbrained members of Poppermost on their MySpace page. Speaking of giving thanks, for 6 long years, we at Poppermost have been thanking all you terrific members of the Popperfamily for your friendship and support of our music. And let's face it, thank yous are nice and all, but after a while it just starts sounding like the same tired, old song. Impress your friends and co-workers! Flaunt in front of jealous relatives and other pesky rodents! Woo and seduce that special someone in the next cubicle! Most important? BRAGGIN' RIGHTS, baby!! Interested? Good. Here's the deal... For the next 12 months, we're running a contest. One lucky winner per month will win a song written especially for them. The theme will be different each month and at the end of the contest, all the songs will make up our next album. Still interested? Good. Go to Poppermost.com and read the "Especially for You" section for details. Good luck! Quick note to give you a heads up. Poppermost’s song, "Isabella Vina," is being featured on Tiana Smith’s website tomorrow. Just click on "Sing Song of the Day" at http://www.tianastar.com/ and look for the October 31st listing to find out what nice things she has to say about us. Please visit and support her as she is supporting us. Tiana’s website was featured in Music Connection magazine due to the promotion she’s giving to other musicians. How cool is that? Thanks Tiana. Also, as most of you well know, we are strict believers in not pestering our friends and fans, which makes this next part a little unorthodox for us. In a couple days we'll be sending another e-mail to make a very special announcement -- a huge surprise for all our friends. Please be sure to tune in again to hear about it on November 1. The month of July marks the 6th anniversary of Las Vegas indie pop band Poppermost as a recording and performing entity. The "Las Vegas Review-Journal's Best of 2007" recipients released their third full-length CD, Bitter Suite Swan Songs, the first since 2004's critically acclaimed Absolutely Sonic. Poppermost also has its own cartoon! The Schoolhouse Rock meets School of Rock project will trace the history of pop music, from ABBA to ZZ Top. "This is our response to the elimination of music and art programs in public schools," says Poppermost drummer and vocalist Ms. Tex Duckingham. "If we allow our kids to be deprived of learning a positive means of expression from our schools, then we're sending them out into the world without the tools for creativity, imagination, and soul. We can do better. That's why we plan to take this project on the road and into the schools." A sneak preview of the Poppermost cartoon characters (Lex, Ms. Tex, and Royal), 3 tracks from Bitter Suite Swan Songs, and a 3-minute aural introduction of Poppermost's new project can be found at www.myspace.com/poppermost. Please contact Suicide Pop! Records at 702-384-0306 or pop@poppermost.com for more information. Greetings to all of you mamas and papas out there! Just popped in to let you know that many ch-ch-changes are afoot here at Poppermost headquarters. And boy, this one's a "doozy." 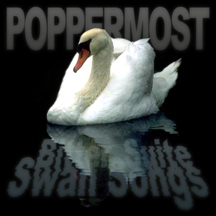 In celebration of Poppermost's 6th anniversary as a "lean, mean music machine" (July 4th, 2007, folks) we are officially releasing our new CD, Bitter Suite Swan Songs. You can get your copy at CDBaby (http://www.cdbaby.com/poppermost5), or through us with PayPal. All the details are on our website (http://www.poppermost.com/poppermusic.html). Also tomorrow, to celebrate our RE-birthday, we are giving you an introduction to the new Poppermost cartoon / comic (via MySpace - http://www.myspace.com/poppermost), which will be a Schoolhouse Rock meets School of Rock hybrid dedicated to the history of pop music, and the preservation of music education in public schools. Swing on by and check it out. You know where we leave the spare key, just let yourself in. See ya then, and don't forget to let your "freak flag" fly this Fourth of July with all your family and friends sharing good food and company! It's been a week of wonderful surprises here in Popperland. First, we took the mastered copy of Bitter Suite Swan Songs to the pressing factory! We'll have it in our hot little hands soon (about a couple weeks, barring any complications). After that, we'll be sending out CDs to some special folks who believed in us enough to show their support and help us raise the money for pressing our latest CD by pre-ordering it for themselves, their friends, and family. We love you and we wouldn't have been able to be here this soon without you. Thank you! For everyone else who has yet to do so, this is your last chance to take advantage of free shipping and handling, and a shot at free CDs if several of you group together and place a pre-paid order for a copy of our new CD, Bitter Suite Swan Songs. Please refer to our last newsletter from December 2006, or visit our music page at http://www.poppermost.com/poppermusic.html for complete details. "Not many R&B bands cite The Clash and Barbra Streisand as influences, and true to form, Poppermost isn't an obvious fit for this category: It certainly won't be confused with Pretty Ricky, and for this, we are eternally grateful. But while not a straight-up R&B act in the traditional sense of the term, these hot-blooded rockers do possess a bit more soul than many of their peers, which manifests itself in a slick, steady groove. They've been described as the 'anti-Hootie fronting The Who,' and thankfully, the band's way more 'Live At Leeds' than 'Cracked Rear View'." If you want to see it online, just click here. On a completely different note... there are changes in the air. More great music, but with a special twist. Stay tuned for the surprising metamorphosis of the new Poppermost that will be coming your way soon. If you don't wish to hear from us anymore, email pop@poppermost.com.